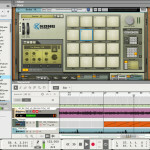 TekMonki » Reason 8, And It Looks Great! Reason 8, And It Looks Great! I got my start (working “In The Box”) with Reason waaaaay back in the day. Well, technically it was ReBirth, but I digress. Anyway, every so often I’m verrrry tempted to get the upgrade at that price point – but I need another technical rabbit hole to disappear into, thereby giving me another excuse not to write a damn tune, like a need a . . .
One day, one day . . .
That said, this update looks HUGE, and very cool! Reason 8 introduces a redesigned user interface with a whole new look and even smoother creative flow, while the new browser and search window provides immediate drag-and-drop access to inspiring samples, loops, and patches. Expanding on Reason’s included collection of instruments and effects are the new amps from Softube, bringing a variety of first-class guitar and bass tones to the rack. Countless workflow improvements make for a more streamlined music creation experience, allowing musicians and producers to move quickly from initial idea to a completed song. And with an ever-expanding selection of Rack Extension plug-ins available in the Propellerhead shop, Reason 8 provides everything users will ever need to make music.